This page is not up-to-date. In King Arthur's Gold there is a long range of blocks. These can be broken or mined by builders -- bedrock and dirt backwall are exceptions. Knights can destroy some of the blocks with their swords (principally wood and dirt). Both Knights and Archers can use their explosives to destroy blocks -- Dirt can't be destroyed by explosives, only damaged. All blocks are affected by gravity, except bedrock and without proper support they collapse. Stone blocks will destroy most other blocks (except stone and doors) immediately on impact. 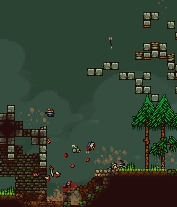 Players getting hit by falling stone blocks take damage or even get killed. "Light" blocks such as Ladders and the back walls will have less devastating effects. They won't kill players or damage most other blocks. Ladders normally get destroyed by any other block falling on them. Support is the attribute of some blocks to have other blocks placed upon them. A block can only be placed if there is an adjacent block that has the "support" attribute. Most blocks give support. Ladders will only support other ladders (maximum of 2 horizontally). Support normally works in any direction, as long as the placed block is connected to the supporting block. Unsupported blocks can't be placed. Solid blocks always add support. Stability is the attribute of some blocks to "hold up" a structure. If there is only one block holding up a structure, and it is not "stable", the structure will collapse. Most blocks in the game are stable, including ladders. This can be confusing, as not every stable block adds support. A good example for this are ladders, which will add stability but no support, except for other ladders. There are also some blocks that are solid, which means they will stay in the air and act as a "base" to build other blocks on them. Solid blocks are for example dirt, rock and thick rock. Basically what the ground is made up of in a normal match. You need to create structures of stable blocks connected to at least one solid block. Destroying the "link" to the solid block will make the structure collapse. This page was last modified on 30 May 2016, at 19:14. This page has been accessed 172,382 times.